Today I interview Michael Margolis, and he tells us how to tap into your superhero origins to create the most important page on your website – your About Me page. 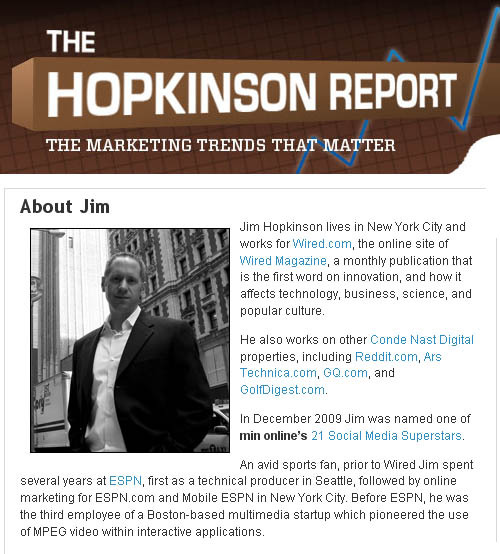 Hi, this is Jim Hopkinson; I’m your Marketing Guy, bringing you the marketing trends that matter. Welcome! Today I interview Michael Margolis, and he tells us how to tap into your “superhero origins” to create the most important page on your website, your “About Me” page. Jim Hopkinson: Hey everybody, this is Jim, welcome to the podcast. Today I have a fantastic guest, Michael Margolis, who is the dean of Story University and the creator of a new program called, ‘The New About Me.’Â So, welcome, Michael. Michael Margolis: Hey, what’s happening, Jim? JH: So, you’re kind of out on a personal mission to help people reinvent their bio as a story. So, talk about that for a second. MM: Yeah, you know, I think part of it for me is; I sort of think about this as personal branding minus the icky stuff. I started realizing my own journey over the last few years; I went through a lot of reinvention in my career, and I’d always been a story teller. But part of what was missing for me is I think personal branding, in many ways, it’s sort of has made a lot of us kind of feel kind of gross. Or sort of like, ‘Ahhh, do I have to be that obnoxious person who’s like, look at me, look at me, aren’t I cool?’ Jim, I don’t know if you realize how much of a big deal I really am. MM: Well, unfortunately, actually, I do like, I’ve got T-shirts and I’ve got mugs and I’ve got a manifesto and a blog, and I’ve got all sorts of stuff. But, it’s less about having the stuff and it’s more about your persona and how do you share more about who you are in a way that people can actually connect with you and relate to you. JH: Yeah, cause it’s really hard right now, a lot of people have used social media to do this, right? It’s a great thing – you can have your own podcast, your own blog, you can have a Tumblr account and do videos, and it’s a great thing and you want to share this, but, you don’t want to be “that guy”, right? JH: How do you strike that balance? MM: Yeah, so I’ve learned a lot really looking at the essential principles at the heart of storytelling. OK, so there are a few things that you can start thinking about this, number one, most of us, when you look at most people’s bios, let’s just get some things out of the way. We all know you wrote your bio! JH: Exactly. And we jumped right into it, so, almost back to exactly what you said. People have these platforms up now; who are the types of people you’re trying to reach? Are they authors, speakersâ€¦? MM: Here’s what I started to think about which is, really, this program is for authors, speakers, bloggers, consultants, and entrepreneurs – anybody whose business is directly tied to their personal story. JH: And that’s really important right now, so if you’re out there and if you’re listening to this, and you’re doing marketing, so if you’re anyone of those people you probably have a website, you better have a website. And like we said, ‘The number one page people are going to go to, you do it out to everyone, is not in your head right now. You know, you get someone’s business card, or maybe you don’t know them, and you didn’t meet them in person, and they’re like, ‘Oh, check me out at ABC.com.’ And, you go there and you’re like, ‘Oh, this looks like a website.’ And, you make that judgment, and the first thing you do is you click on their About page – do they have a photo up there, do they like your favorite team, are they all business, do they have a video on there? And it’s amazing that that’s the number one page with huge repercussions, but people probably don’t spend enough time thinking what it should be. Who taught you how to write your bio? JH: No one did. You look at other people’s, and you do that, ‘Jim Hopkinson is a marketing guy that lives in New York.’ Yeah, there’s no instruction manual. MM: And in many ways, people who are on those professions; a lot of us haven’t even been asked for our resume in years. It’s like the resume is dead and the bio is king! MM: So, here’s how superheroes origins works. OK, think about your favorite superhero. MM: Batman, Wonder Woman, Superman, down the line. They all have an epic origin backstory for how they came into their powers. MM: Because we often forget there are very, very few superheroes that are born superheroes. What happens is you are made a superhero whose circumstances and the choices that you make in the face of those circumstances. So, in the case of Batman, here was this young little kid, I think he five or six years old, born in a family of billionaire parents, he sees his parents gunned down before his very eyes, and in that moment his life is forever changed. And, we know how the rest of the story goes, he ends up devoting his life and his family’s riches towards justice, and basically, making the world right again. And so, think about that for your own self, like we all have this sort of seed or kernel story that speaks to our own origins and out of that how our motivations emerged. I’ll give you a great example of this. Take like Gary V. for instance – like Gary Vaynerchuck, right? MM: We all love his passion, his energy, and he’s one of the poster child[ren] in the social media movement. He does a masterful job of telling a superhero backstory. JH: Right. Grew up in New Jersey, parents running a liquor store, and they didn’t have that much sales and he said, ‘I’m going to build this into a conglomerate.’ Right? Is there more? There’s more. JH: Did he get bitten by a radioactive spider? MM: Exactly. Right? And so from there he steps back and, he’s like, ‘Oh, wait a second.’ You know, like after he recovers from the disappointment, he got pulled into the family business. It’s like, ‘Wait, people’s passion for wine is kind of the same obsessive passion that people have for baseball cards. It’s actually lo and behold about the story, right? And so, there is this epic backstory to Gary V. that we’ve fallen in love with. Now, some people hear that and they go, ‘Well, dude, we’ve all seen Gary V., and I ain’t no Gary V’ – understandable. But there are other ways you can do this. JH: I can see her doing that, as you say, right. origin backstory could be something that happened to you as a kid. It could be something that happened to you in your early career. But, it’s about giving people the context that helps them understand how you’ve come to see the world the way that you see the world. JH: Alright, so when people are putting together their About page, let’s get some bad examples for us. I guess the worst example would be not having one at all, right? JH: And are there things that should not be in an About page, what are some bad things that you shouldn’t have in there? MM: Well, here’s my perspective on it. And, that is, Jim, I think people spend too much time trying to validate themself, instead of actually standing in the power of their own natural authority. Let me explain what I mean by that. There’s no greater turn off than starting to read somebody’s bio that starts with a long list of 12 difference accolades including how Time Magazine calls this person, ‘One of the Ten Smartest People in the World.’ What that says to me is this person is really insecure if that’s how they need to start their story. Don’t get me wrong, we all need external validators and social proof in our bio. In my experience what really works, though, is when you introduce those two-thirds or three-quarters of the way down in your bio, because you want to stand firm, and [â€¦], like you want to lead with, number one, who am I?, what do I do and who do I serve? Because, we always forget this. When you’re writing a bio, just like when you’re telling a story, you need to do it in service to your audience. MM: Most of the time we write our bio for our own ego validation. So, that’s the thing, that’s one of the things you really want to pay attention to and really think about, if you’re writing this in service to your audience – name your audience; who are you working in service to? Like, I’ve always worked with innovators and changemakers and taught them how to get others to believe in their story. And, I serve that audience because that’s been my own path in life. You know, my dad’s an inventor, my mom’s an artist and teacher; I was a social entrepreneur early in my career, and I’ve always worked with new, different ideas or visionary world-changing projects and looked at how do I translate and get that story out into the mainstream. JH: So, should you start, should you write it in the third person, or in the first person? Is there a right or wrong way? MM: You know that’s a great question; a lot of debate that people have around that, I believe there’s value for both. The act of writing your bio in first person is more approachable and accessible. And, certainly if you have your own website, your own blog, and part of your editorial point of view through the rest of your site is in first person, by all means, also write your bio in first person. You also are going to need a third person version of that bio if you’re on the speaking circuit or if you’re an author and it’s the back of the cover, there’s going to be times and places you need the third person version. JH: That’s almost like a resumÃ©; you want multiple versions of your bio depending on what the value is, what the task that you’re going after. MM: Yeah, ultimately, and this scares people, this is kind of like the advanced sort of level to get to is you need to have a one page bio, a one paragraph bio, and a one sentence bio. JH: No, I think that’s definitely true. I’ve seen that on, I’ve done some speaking here and there, sometimes you need it for books, sometimes you need it for a class that you’re teaching and everyone needs something different. JH: I change mine constantly. Like I’m never happy with what I have. MM: We are all guilty of that including me, Jim. Every single time, I do my share of sort of speaking and getting out and about, and every single time I’m submitting for some new event, I’m constantly tweaking and doing microedits on my bio. And I think there’s an aspect to it that’s OK, because part of it reflects the following: I don’t know about you, but my story is constantly evolving. I’m constantly creating new things – new products, new offerings, new happenings. You know I curate a virtual conference called, ‘The Reinvention Summit’ that in its first year we had 37 speakers and 500 participants. I’ve got my own podcast series; like, I have a hard time keeping up with my own story. MM: So, here’s the thing, what’s important for people to remember is the world is changing, your own life is changing and evolving, which means that your own bio needs to be revised on a regular basis. This is not some static thing; if you have the same bio that you had six months, or if you have the same bio you had a year or two ago, you know what, it’s time to go back to the drawing board and reedit it. JH: Alright. So what about, are there certain photos you should put on there; what about a video bio? Is that something you should have on there? MM: There are all sorts of really creative ways you can go about it. So, I have sort of a system, I take people through that teaches them sort of the fundamentals from a storytelling perspective; from kind ofÂ making their purpose value statement to sharing a backstory, articulating their own point of view, introducing external validators and then humanizing personal details. So, that’s kind of like the core, but then I’ve seen this whole kaleidoscope – there are so many creative ways. Like, I’ll give you an example of one person’s bio I love. So, they have the regular bio on their page, and then next to it they have a reverse chronological history of their life. like this person has this little vignette about who they were and how they saw the world. That little, like sort of like that blip in time. JH: ‘Age two – it’s only been one year, but, I’ve doubled in age.’ [Laughter] At this rate, at 64, the next three weeks, or something. JH: So, I’m almost afraid. Should we go through and look at my bio and point out all the things that are right and wrong? Alright, so that’s the intro. I’m looking at it right now and saying, ‘Well, does the fact that I live in New York mean anything?’ and I guess if it’s a Wired podcast, it’s good to give the background of what Wired is, and then it goes on to say, ‘He also works for other Conde Nast digital properties including Reddit, Ars, Technica, GQ, and Golf Digest.’ So, is that a good start, I’m kind of giving the background of Wired and where I work? JH: And I think, personally, the reason I have the New York City is 1), because Wired is based in San Francisco, people might know that to show that I’m not in the San Francisco office, and 2), that it’s going to have kind of that New York City feel, so to speak. I don’t know, things happen really fast and I talk really fast, and it’s kind of that business attitude versus maybe the laid back kind of entrepreneurial Silicon Valley attitude; but, I don’t know. MM: So, two things: 1) real quick, about naming where you live – that’s a great thing. MM: Remember, the key is to tell a story people can locate themselves into, or one of the first ways I need to locate myself in your story is time and place. Where are you? MM: You’re in New York City. It immediately conjures up an image in my mind’s eye. So, naming your location, whether that’s at the beginning of your bio or later on towards the end, just in general, it’s a good thing. MM: Especially in our virtual world, people like to know, what are you tethered to, what’s your story of place. OK, now, you’ve got this lead all about Wired, which is cool, the one thing that’s missing for me, though, that I would like to see more of first, which is more about your point of view. MM: Like how is it that you look at the world, like what’s your curiosity, and, actually if we look further down the page, it actually shows up where you describe about the podcast. MM: Where you’ve got here, ‘Jim Hopkinson, Wired.com’s Marketing Guy takes a fresh and funny look at the marketing trends that matter. From internet and new media to business and pop culture, Jim and his guests provide their unique perspective on marketing in the digital age.’ That’s heading more into a point of view. It’s sort of like, ‘Here’s my perspective on things.’ I think you can still take that point of view and perspective and actually even chisel it to a finer point, sort of a sharper tip of the pencil. MM: One of the ways that I talk to people about this, around their thought leadership is it’s not so much about all of the answers. It’s not what you have to tell people in your bio, cause, let’s be honest, we live in such a complex age none of us have the answers right now. Instead, what you want to focus on is it’s about framing the right questions. So, think about whatever your niche is; whatever your field is, what’s missing from the conversation? You know, and I know that you actually have talked to me about this, the reason you started your podcast was you were thinking, you know, the world of technology, like we get a little too geeked out. What if we talked about pop culture with a bit of humor and playfulness about the latest happenings in the world of tech? MM: Right. That was the inception point for the podcast, right? JH: Right. Because plenty reviews of the new Android Froyo phone that says, ‘Well, it’s got a 30.1GHz processor, and it has a 2.3 megapixel camera.’ I want to know does it take good pictures; can I take a picture with one hand at a party holding up above my head? Can I share that with my friends, and how are people really using this stuff, and when they put the button in the wrong place I like to rant about it and get really excited about why did they do this, and why don’t other people complain about this, as well? MM: Totally. You’re really looking at the larger cultural context of stuff, looking at marketing trends and cultural social trends that are impacted by technology. MM: So, I would encourage you, you want to lead your bio speaking more about your point of view. Like what’s the riddle you’re trying to solve? What are you really curious about most? JH: And I can say, ‘I’m looking to solve riddles just like when I won a Rubix cube contest when I was in 8th grade.’ That immediately classifies me as an ubergeek and one hand it makes me king of the geeks and then king of the losers, at the same time, I think. MM: Absolutely. Yeah, that’s a great way to introduce that, sort of like anchoring things to your own backstory and mythos in a way that sort of gives you street cred for the story or the message you’re trying to put forward in the bio, totally. JH: And then I go on and say, ‘In December 2009, Jim was named one of min online’s “Top 21 Social Media Superstars.” So, that was a little bit about that bragging you talked about that maybe could be a little bit lower. And then I kind of give almost like the resume look, ‘An avid sports fan – prior to Wired, Jim spent several years at ESPN, first as a technical producer in Seattle, followed by online marketing for ESPN.com and mobile ESPN in New York. 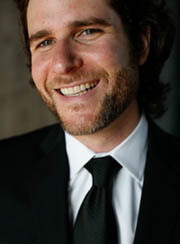 And before that he was the third employee of a Boston-based multimedia startup which pioneered the use MPEG video within interactive applications.’ That’s almost the resume version which does give me that pop culture, ‘Oh, I’ve worked in sports, I’ve worked at a startup, I lived in different parts of the country’ – good or bad? MM: It’s a bit of both. Here’s what you want to think about with the process of updating your bio. OK, it’s just like with good storytelling; it’s about taking the implicit and making it explicit. It’s taking the invisible and bringing it to the surface. So, it’s great that you’re giving me sort of the twists and turns of your career. The sense of like there was a chapter here, there was a chapter there, giving me a few kind of plot points along the way. And, there are some really great notable icons like your sports marketing background; it’s actually kind of interesting. The fact that you kind of were playing on the technical side of it, as well; but, what you haven’t done is connected the dots for me as the reader of why should I care. MM: Like, how does that experience inform or allow you to now do what you’re doing? JH: And right as you’re talking about this, I already know exactly what I want need to do. It’s kind of like, ‘An average sports fan in 1998 he got fed up with pressing CD ROMs, and decided, he quit his job, moved all the way across the country to check out this new thing called the internet,’ you know? And then, talking about the third employee of a startup, why did I go to a startup; and what was the lesson I learned there? And, the one I tell all the times, it’s not one of those startups where you’re worth a billion dollars and they’re going to be stock options, it as one where you didn’t get paid a lot, and, you worked twice as many hours as a normal job. JH: Did you know I was ranked as a â€˜Top 100 Fantasy Hockey Player’ in the year 1999? But, what does that mean? So, if I think of the reader, it’s, I do so much ridiculous amounts of research, and I’m so dedicated to things that I’m passionate about that you’re in good hands with me when I start talking about something that I get fired up about. MM: Yeah. You could talk about that your obsession with fact finding details, you know, led you to be a top ranked so and so of a fantasy league. JH: Well, that’s super helpful. Any other tips for me for like reshaping the bio, what else am I missing? And, actually, that intimidates us, and we go, ‘Well, this person is not approachable.’ Instead, talk about things like your TV guilty pleasures. Mine are Celebrity Rehab and Millionaire Matchmaker. MM: Reveal that secret to people, or maybe you’ve talked about it before. So, the point of this is that you don’t have to share everything with people, but it’s picking a couple things that you’re like, ‘Oh, you know what, some people are really going to relate to this’ and it speaks to your personality, your character, and sort of how you like to interact with the world. JH: I actually do have that, interestingly, in a much smaller format on my Twitter bio, when you only have a few words. So, my Twitter bio says, ‘Blogger, podcaster, online marketer, gadget guy, social media maven, sports fan, runner, and city dweller’ – that kind of hits on a lot of those same things; but, only inÂ Â 300 characters or something like that, in the intro. So, let’s say people do have a blog, a podcast, an entrepreneur, where can they go to learn this stuff, cause we talk about nobody really teaches you it; where are places that people can start to learn about this stuff? MM: Yeah. Well, I mean this is the shameless promotion or plug, because I created this out of sheer frustration. Because when you start Googling and looking for this stuff, there’s very little out there that talks about this in a meaningful way. Most of the stuff is kind of a rehash of a lot of like personal branding hoo-hah kind of garbage; sort of about how to puff your chest up and sort of tell people how self-important you are, and all that bragging stuff a lot of us are afraid of and kind of makes us feel icky. 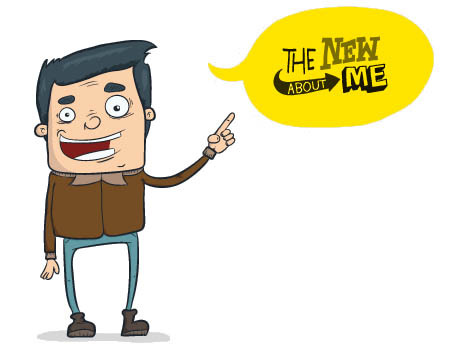 So, I mean people can go, on my website, I’ve got actually a whole site set up for this called, ‘TheNewAboutMe.com.’ And, you can go there, you can actually download; I’ve got a free download that gives you a checklist of some basic, simple things of where you can start. And then I do have an actual whole program that breaks down and teaches this system. It’s a self-paced program with a whole series of videos and missions and exercises, lots of case examples; and, really a whole community and tribe that I’m building and organizing around this. JH: So, how did you decide on doing it that way? You probably got a lot of good feedback from people talking to them, did you, you could do it through a blog, you could do it through like personal classes; how did you decide on like a seminar, like a webinar, right? Is it a webinar, or a video seminar, how does it work? MM: Yeah. Well, I really think about this in the context of online education. So, it’s part of my Story University, and it’s really been a journey over the last two years of building my own sort of DIY very fledging social media empire where I started with a manifesto, I wrote a book called, ‘Believe Me: a Storytelling Manifesto for Change-Makers.’ You can buy it on Amazon; you can also download a free copy of it, a digital copy of it off the internet if you go to,’believethebook.com.’ That started to sort of just get out like wildfire; lots of conversations that were struck up by that. I started a podcast series. I’ve got a website, at ‘getstoried.com’ with lots of articles and resources around storytelling. I then curated a conference, ‘The Reinvention Summit’ that happened online. And, I’m just a big believer; part of my mission, really, the heart of my mission is around evangelizing and democratizing storytelling. I believe everybody’s a storyteller. MM: Think about it this way, we’ve all become the narrator or the director of our own life’s story and social media had pretty much blown the lid off of this. Look, we’re more similar than we’re different. Help people find the invisible lines of connection of the things that we share in common which is why more of those humanizing personal detail are so important. JH: for being a guest. So, where can people go again to learn more about everything that you’re talking about? MM: So, I encourage everyone to check out ‘TheNewAboutMe.com,’ and people can go there and download a checklist that will have you start to take a look at sort of does and don’ts of what’s working with your current bio. We also have free webinars that give you some more practical tools and tips to put this into practice. And then, of course, the larger system, if you really want to go through and really get into the anatomy of your bio and really looking at what are the assets that you have from your natural life experience that are going to lend themselves towards telling a bigger story, you’ll find all of that there. Also, just connect with me on Twitter, I’m at ‘getstoried’ – I like to take words and turn them into verbs, so, it’s ‘getstoried’ and through there you can also download my Storytelling Manifesto for free, and lots of other sort of breadcrumbs and kernels that are out there, and would love to hear from anybody who’s listening to the podcast. JH: Awesome. I’m going to go update my bio and find my superhero origins. JH: So, thanks so much for coming on the show. MM: Thanks for having me, Jim. A huge announcement for everyone with an iPad that loves Wired, starting in late May, if you subscribe to the print version of Wired, you’ll also get access to the iPad version, or you can subscribe to the digital version right from iTunes. So, check that out. This entry was posted on Thursday, May 12th, 2011 at 6:06 am and is filed under Branding / Advertising, Interviews, Marketing Case Studies, New York City, Social Networking / New Media. You can follow any responses to this entry through the RSS 2.0 feed. Both comments and pings are currently closed.